More than 50 percent of physicians are burned out, resulting in poor patient outcomes, increased suicide rates, bad judgment and other negative consequences. Your healthcare organization faces many challenges in reversing this trend, but it's well worth the effort. Your doctors improve their productivity and contribute toward a positive work environment, patients get the quality of care they deserve and you get significant cost savings. These six strategies tackle physician well-being from many angles so you can create systemic change. You can't fix something if you don't know how broken it is. You need to put assessment tools in place to evaluate exactly how bad burnout is in your organization. In some cases, the physicians have no idea that they're struggling until they go through this process. Many symptoms of burnout can be attributed to general life stress or other factors, so medical professionals may brush it off until things become more dire. You can't control every factor that leads to physician burnout, but you can identify problem areas in the working environment. Change doesn't happen overnight, but starting the conversation about burnout in your organization is a good first step. You can collaborate with your physicians to discover improvements that can reduce anything contributing to this problem. Flexible scheduling: Put wiggle room in the typical shifts offered at your healthcare organization. The most productive hours for each physician may not be tied to the default schedule you have in place. A doctor may put in more hours on one day so they can clear out a day that they prefer to rest or socialize. Night owls can avoid the mornings and see patients during the evening hours, while the morning people can show up bright and early. Video conferencing: Teledoctor technology provides physicians with a way to stay productive without being present in the office. These work-at-home days offer a much-needed break from a busy hospital or clinic setting, and your patients get access to an excellent innovation. Active hiring: Sometimes the solution to your physician wellness problem is simple but expensive. Bring in qualified doctors when you see your current roster getting overloaded by patients and other duties. Working with patient records, requesting information from other doctors and staying on top of the latest reports takes up a lot of time. Some physicians work on administrative duties as much as they do their patients. Look for inefficiencies in your back office operations and deploy more productive systems. An intervention at the beginning of a burnout period can prevent more consequences from occurring. A proactive monitoring solution of your physician wellness gives you visibility into what's going on with your doctors and the trends that impact their well-being. Give physicians the resources and support they need to address burnout. For some practices, convenient mental health care and on-site fitness centers can help doctors get back on track. In other locations, you may need to add green spaces to the medical facility or a lounge room. 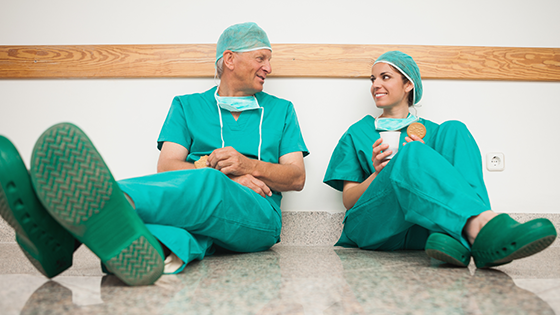 Physician burnout has an impact on your entire organization. Measure the well-being of your physicians with the Well-Being Index, and start on the path to improvement.